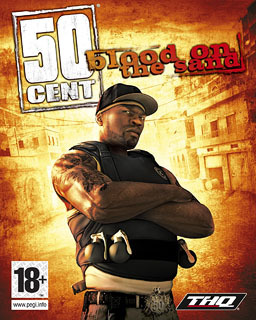 Continuing my trawl through games I started then set aside, last weekend I completed 50 Cent: Blood on the Sand. This is a dumb, fun, 3rd person cover based shooter. It’s a riff on the same gameplay mechanics in Gears of War 1 and 2 with an over the top plot and mixed production values. The story follows the adventures of 50 cent and his crew in the middle east. They get ripped off by a concert promoter who offers them a jewel encrusted skull in lieu of payment. This also gets ripped off and 50 cent and his buddies spend the rest of the game shooting and cussing their way through various middle eastern locales in their quest to retrieve the skull. This game has no pretensions of grandeur – it’s the videogame equivalent of a B-movie and it pretty much delivers. The graphics, models, and audio are all middle of the road, but the feel is solid and the game isn’t long enough to wear out its welcome. It has a bit of arcade scoring in the mix, where stringing together insults and combos raise a score multiplier, but for the most part I just ignored this and blew through the levels. I only busted out a curse/combo now and then as I unlocked new curses, for the laughs rather than to help with the score. You can find this game for under $20 new and often for under $10, and it’s worth it for the laughs at under $10. It won’t win any awards for originality but it’s a fun ride while it lasts. Video below of some gameplay and cutscenes to give you a sense of it. I finished it on the xbox 360, it’s available for the PS3 as well. It’s got an average of ~72 over on metacritic, and that feels about right to me. i could have finished this game for you, jiffy-quick, if you had come to clean one of my rooms. mebbe the full-of-unsorted-vinyl room. Somehow, I doubt this, based on my recollection of whupping you in football on the atari 2600 back in the day. Admittedly these memories are 30-something years old, but still…color me skeptical that you could have successfully guided 50 cent on his not so epic quest. I WILL DEFEAT YOU. TO YOUR 50 CENT I THROW DOWN 60!!! YOU WILL CLEAN MY ROOMS! AND YOURS TOO! FINALLY. I WILL DEFEAT YOU. TO YOUR 50 CENT I THROW DOWN 60!!! YOU WILL CLEAN MY ROOMS! AND YOURS TOO! FINALLY. (btw, it was atari baseball, which you and matthew millen had marathoned 24 hrs before you presented it to me.) t’anks for the memories.